The BCS allows for the connection of (2) 2x's to a 4x post or (3) 2x's to a 6x post. Double-shear nailing between beam and post gives added strength. The BC series offers dual-purpose post cap/base for light cap or base connections. Structural composite lumber columns have sides that show either the wide face or the edges of the lumber strands/veneers known as the narrow face. Values in the tables reflect installation into the wide face. See technical bulletin T-C-SCLCLM for load reductions resulting from narrow-face installations. 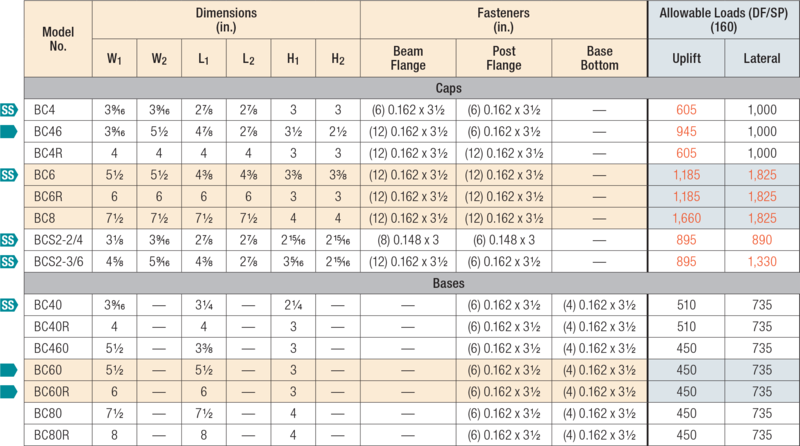 Base allowable loads assume that nails have full penetration into the supporting member. Loads do not apply to end-grain post installations. SSA10d, SSA16d nails are Simpson Strong-Tie® stainless steel ring shank nails. NAILS: SSA10d and SS10d = 0.148" dia. X 3" long. SSA16d and SS16d = 0.162" dia. X 3 1/2" long. See other nail sizes and information. Must be installed in pairs. Load shown for SET epoxy. For AT adhesive use 985 lbs. BC See specific model numbers for code listings. BC40R No evaluation report listing. BC40SS No evaluation report listing. BC460 No evaluation report listing. BC4SS No evaluation report listing. BC60R No evaluation report listing. BC60Z No evaluation report listing. BC80 No evaluation report listing. BC80R No evaluation report listing. BCS2-2/4SS No evaluation report listing. BCS2-3/6SS No evaluation report listing.